This is really pretty yarn! I didn’t notice the color name until I got home. Perfect. Urban ninja! hiya! 2013-9-22: ugh. I can’t seem to get this one right. The pattern is wonderful but I may have picked the wrong size…again. I already frogged it once, so I’m putting it away for now. I just finished sewing the sleeves and tried it on. It fits, but I’m afraid the yarn may not be right for this, or I crochet too tightly because it is stiff. Maybe it will loosen up as I wear it, and to be fair, it isn’t finished so I don’t know if it will fit better once complete. I do love the pattern and the yarn, so it will hibernate until I’m in a better mood. 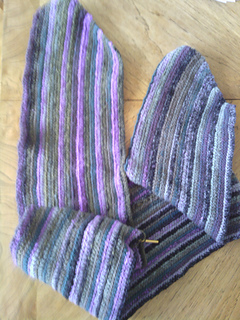 2014-2-4: I love the pattern and the yarn but I don’t think they are right for each other. I have a lot of the yarn so I’ll make a pullover with it, and find some different gran for the vest.